Web of Science: What do scientists know about "laukagarða", described in the Icelandic sagas? Palynology, the study of plant micro-fossils known as pollen, is used by palaeoecologists to identify the character of past plant communities. In Iceland, palynology has probably been used to best effect in discerning the transition from a natural landscape, influenced only by climate and volcanism, to an agricultural landscape arising from the process of human colonisation in the late 9th century. The most significant change at this time was a reduction in birch (Betula) woodland, and a concomitant expansion of wetland and grassland habitats, to provide pasture and hay for livestock. There is evidence in the pollen record to suggest that Iceland’s early settlers (and later, medieval farmers) cultivated cereals, most probably barley (and perhaps oats). It is likely that this was always an endeavour fraught with difficulty and that cereal cultivation was probably restricted to wealthy estates, those able to secure the labour required to nurture the crop. 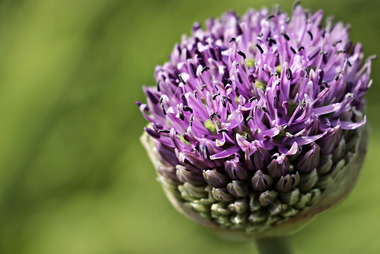 The pollen of insect pollinated plant species (such as Allium) is unlikely to be present in the sedimentary record due to limited pollen production as opposed to that of wind-pollinated plant species. The manner in which pollen is dispersed will influence the type of pollen stored in sediments, i.e. the pollen of insect pollinated plant species (such as Allium) is unlikely to be present in the sedimentary record due to limited pollen production as opposed to that of wind-pollinated plant species, e.g. grasses, birch etc. The other key difficulty is in distinguishing the pollen of cultivated species from closely related wild plant species e.g. pollen belonging to Brassiaceae can represent a range of plant species, both domestic and wild. Following the formal adoption of Christianity in Iceland at the end of the 10th century, the subsequent establishment of bishoprics and monasteries may have witnessed the introduction of some medicinal plants. Pollen and macro-fossil remains from archaeological contexts at the monastic sites of Skriðu and Viðey have revealed the presence of Allium spp., Valeriana officinalis and Sanguisorba officinalis etc. Pollen and macro-fossil remains from archaeological contexts at the monastic sites of Skriðu and Viðey have revealed the presence of Allium spp., Valeriana officinalis and Sanguisorba officinalis etc. Overall, while palynologists have a general grasp of land use and land use patterns in Iceland’s medieval past, specific detail pertaining to certain plant species is limited. It has been argued that the "laukagarðr" of Laxdæla saga is in fact an allegorical rather than actual vegetable plot, referencing the Old Testament's tale of Gideon and the fleece (Judges 6:36–40). The term "laukagarðr" appears first in an Icelandic translation of this tale in Veraldar saga from the early 13th century. In addition to Laxdæla saga, Icelandic law codes from the late 13th century also mention onion plots - as well as angelica, apple and turnip patches - but the clause is borrowed directly from earlier Norwegian law and does therefore not constitute unambiguous evidence for vegetable cultivation in Iceland at this time. The earliest unequivocal reference to a vegetable garden in Iceland is from the 16th century when there was a "laukagarður" in Hólar in Hjaltadalur, the episcopal see of northern Iceland. Edwards KJ, Erlendsson E, Schofield JE (2011) Is there a Norse ‘footprint’ in North Atlantic pollen records? In: Sigmundsson S (ed) Viking settlements and viking society, papers from the proceedings of the 16th Viking congress , Reykjavík and Reykholt, 16th-23rd August 2009. Hið íslenzka fornleifafélag and University of Iceland Press, Reykjavík, pp 65-82. Einarsson Þ (1962) Vitnisburður frjógreiningar um gróður, veðurfar og landnám á Íslandi. Saga 3:442-469. Erlendsson E (2007) Environmental change around the time of the Norse settlement of Iceland. Dissertation, University of Aberdeen, Scotland. Erlendsson E, Edwards KJ, Lawson I, Vésteinsson O (2006) Can there be a correspondence between Icelandic palynological and settlement evidence? In: Arneborg J, Grønnow B (eds) Dynamics of Northern societies: proceedings of the SILA/NABO conference on Arctic and North Atlantic archaeology , Copenhagen, May 10th-14th, 2004. P.N.M., Copenhagen, pp 347-353. Hallsdóttir M (1987) Pollen analytical studies of human influence on vegetation in relation to the Landnám tephra layer in southwest Iceland, Lundqua Thesis 18. Department of Quaternary Geology, Lund. Helgadóttir GP (1981) "Laukagarðr." Speculum norroenum. Norse Studies in Memory of Gabriel Turville-Petre , Odense, pp 171-84. Kristjánsdóttir S, Larsson I, Åsen PA (2014) The Icelandic medieval monastic garden - did it exist? Scandinavian Journal of History 39(5):560-579. Rafnsson S (1989) Í laukagarði Guðrúnar Ósvífursdóttur. Skírnir 163, pp 347-50. Riddell S, Erlendsson E, Gísladóttir G, Edwards KJ, Byock J, Zori D (2017) Cereal cultivation as a correlate of high social status in Medieval Iceland, Journal of Vegetation History and Archaeobotany , (forthcoming). Free photo: Ornamental Onion, Allium, Flower - Free Image on Pixabay - 2300984. (Sótt 28.11.2017). Fornleifar á Skriðuklaustri | Aldarafmæli. (Sótt 23.11.2017). The last paragraph in this answer was written by Orri Vésteinsson. Scott John Riddell. „What do scientists know about "laukagarða", described in the Icelandic sagas?“. The Icelandic Web of Science 30.11.2017. http://why.is/svar.php?id=74829. (Skoðað 21.4.2019).